Male (Maldives) – December 19, 2018 (travelindex.com) – S Hotels & Resorts, a subsidiary Thailand’s Singha Estate PCL, will showcase the cultural charm and diversity of the Maldives as part of its most ambitious development to date and the first phase of the Crossroads Maldives integrated leisure and resort destination. Scheduled to open in summer 2019, this spectacular project will encompass three independent islands fringing the Emboodhoo Lagoon in the pristine South Malé Atoll, just 15 minutes by speedboat from Malé International Airport. Upon completion, Crossroads will offer two captivating hotels, SAii Lagoon Maldives and Hard Rock Hotel Maldives, plus a wide range of facilities centred upon The Marina @Crossroads, an 11,000 square metre lifestyle, retail and dining destination. The Maldives enjoys a unique geographical position in an historically significant area of the Indian Ocean. From being a stop-off point for trading ships between Europe, Africa and Asia, to its current status as a global tourism hotspot, the islands of the Maldives have always been a place where different cultures meet. Every nation and civilisation that has touched this isolated archipelago has left its influence, from Islamic traders to European voyagers. This melting pot, combined with local folklore and a unique, laidback way of life, creates the distinctive DNA of Crossroads Maldives and its resorts. “The Maldives is a truly beautiful destination – a tropical island paradise where guests can fulfil their vacation dreams. But there is more to this enchanting country than just sun, sea and sand. The Maldives has a rich history that has been shaped by its unique maritime location at the crossroads of different cultures. 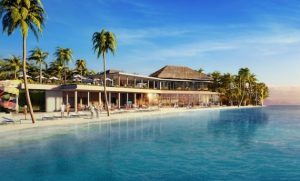 The facilities that make up Phase One of Crossroads Maldives will encourage guests to delve deep into the diversity of the destination, whilst also embracing the country’s exquisite natural beauty,” commented Dirk de Cuyper, Chief Hospitality Officer, S Hotels & Resorts. Central to this concept will be the Maldives Discovery Centre, a cultural attraction that will showcase Maldivian customs and cultures through interactive displays, video and hands on experiential adventures. The centre will also display and sell handcrafted products created by local people, women in particular. The overall aim is to create mutual and sustainable benefits for long-term prosperity of the entire area. Scheduled to open in June 2019, Crossroads Maldives will feature an array of world-class attractions. Hard Rock Hotel Maldives will feature 178 rooms, suites and villas, plus family-friendly experiences and Hard Rock’s branded concepts, including a Hard Rock Cafe®, Rock Spa® and a Rock Shop® selling merchandise and showcasing music memorabilia. In addition, SAii Lagoon Maldives will offer an original and inspiring new resort concept featuring a range of distinctive rooms, beach villas and overwater villas, as well as extensive water sports, cultural activities, wellness and world-class dining. The resort will be part of the eclectic Curio Collection by Hilton®. S Hotels & Resorts will play a key role in developing local talent in the hospitality sector, particularly through its two hotels. Overall, Crossroads Maldives will create approximately 1,000 jobs for local islanders, providing genuine benefits to the destination as a whole. By showcasing the country’s rich cultural heritage, engaging with local communities and preserving the pristine environment, Crossroads Maldives is weaving together the past, present and future of the Maldives and ensuring the sustainability of this captivating destination for generations to come.